(2015 results and continuing MLCs were Coalition 9 Labor 7 Green 2 Shooters 1 Christian Dems 1 Animal Justice 1). Close multi-party contest for remaining three seats. Count is extremely complex. The ABC website has been projecting seats as won directly off the check count and this is very unreliable. Labor (#7) and One Nation (#2) currently appear well placed for two of these seats after preferences, though One Nation is vulnerable to leakage. A preference race will occur between four parties for the final seat: Christian Democrats (now leading), Liberal Democrats, Animal Justice, Keep Sydney Open. Keep Sydney Open appears to be struggling to catch Animal Justice. Animal Justice appear to have at least realistic prospects of beating the other two after preferences. Sustainable Australia was competitive earlier in the count but its primary vote does not appear to be sufficient. The comments below are classified Wonk Factor 5/5. To highlight how weak the flows between LDP and CDP might be, in 2016 Senate only 1.8% of LDP above the line preferences were #2 for the Christian Democrats, while 4.5% of CDP preferences were #2 for the LDP. If one of these gets eliminated it's going to be very hard for the other to gain much with the very high rate of exhaust. I'll be looking in more detail at how realistic it is for Animal Justice to gain .072 of a quota on preferences and will probably post up a new thread. It seems to me that all of CDP, LDP and AJP have realistic chances here and the outcome won't be callable in advance of the button press. But based on the large volume of preferences, the increase in preferencing, and the two largest preference sources being left-wing, it seems to me that Animal Justice can get this. The Liberal Democrats need to both beat CDP and stay ahead of AJP. My modelling below suggests the first is not impossible but might be difficult; the second is not trivial either. I've removed some comments from this entry because of a calculation error. In the 2016 Senate race the Liberal Democrats gained preferences at 1.45 times the rate of the Christian Democrats. In 2015 NSW the CDP gained .015 quotas on preferences before the Liberal elimination, but that was out of a preference pool worth 6.7% that time compared to about 11% this time, and with only half (15/28 according to Antony Green) the rate of ATL preferencing. Applying the obvious crude multipliers the CDP might be expected to gain .046 quotas, so if the LDP maintains the ratio from 2016 that would give them only a recovery of about .02 quotas - which is not quite enough. At present the gap is .026 quotas. As I started to suspect on Monday, the initial count appears to have been inaccurate, but it seems it was so for some parties more than others. This especially applies to AJP and CDP who seem to have been undercounted by about 5%, probably because counters doing manual sorting encountered their votes less often, tended to forget they were a counted party and put them in the Others pile. The Liberal-National and One Nation votes also seem to have been slightly undercounted (1.4% and 2% currently, though this may change with the remaining 300K primaries to go into the check count) while the Labor, Greens and Shooters votes seem about right. The other possibility is that there is some sort of bias in the remaining votes that will drag these apparently undercounted parties back to scale. I'll just watch the check count for now as projecting off the live count seems unreliable because of the possible error issue mentioned below, and we should get the final check count tomorrow. Animal Justice are in this if they're good enough on preferences. Ross Leedham has suggested there may be an undercount of the main parties caused by some votes for them being in the Others pile. If so (and I've felt for a number of days that there was something not quite right with the continual finding that Others were being undercounted in the check count) then this would be good news for Labor, One Nation, CDP and AJP and bad news for LDP and KSO. It would mean not only that the latter were stuck where they are (apart from any further decline in the rest of the count) but also that CDP and AJP are going to finish slightly better than the main count suggests. The initial count is now showing estimated quota figures for the seven listed parties, but the figures are grossly misleading because they add to 22 quotas for the seven, inflating all of them and allowing no room for Others. Hopefully this nonsense will be removed soon. The check count quota is up to 174K. The district of Orange is still virtually uncounted and there are a few more that have not had much counting. The LDP are on 2.19% (almost exactly where I expect CDP to finish) and KSO are on 1.83% (almost exactly where I expect AJP to finish) - barring large gaps opening up, we may have two preference races there. The Others vote is still supposedly under-represented in the check count but I wonder if this is really the case to such an extent (we'll find out if the Others parties start rising soon!) It might be worth noting some of the other Others parties at this point: SUS-A 1.47 VEP 1.06 AC 0.57 SBP 0.68 (percentages). Counting is expected to complete on Thursday, allowing a few days to model things before the button press on Monday! Keep Sydney Open have now dropped behind AJP in the check count but it is not clear they will finish there. KSO are currently on 1.88% in the check count and LDP on 2.22 (precariously ahead of CDP). The most undercounted seats remain rural and regional (Bathurst and Orange are below 10% and none of the eleven below 50% are Sydney seats). The apparent undercount of Others parties may mean that the uncounted votes in Sydney seats include a lot of absents. That's how KSO might still finish above AJP although projected not to. If the Liberal Democrats can finish at around .510 quotas as per Ross Leedham's projection, then they should be safe from CDP. They should also be safe from AJP but I would not be completely sure about that, if preferencing has increased markedly from 2015. Labor .085 quotas, Animal Justice .065, Shooters .044, Coalition .042, No Land Tax .025, Christian Dems .015. It is basically the same line-up except with One Nation added. AJP outdid CDP in the preference distribution by by .05 quotas (about .23%) last time. On a simple ratio to the above they could go right over the top of both CDP and LDP from where they are, gaining as much as .16 quotas (they'll probably need about .11). As against that, however, their biggest gain on CDP was on one specific preference source (Greens) on which they gained at a rate of about .1 votes/vote; the rest of the time they gained at only about .02. Once this is plugged in, the AJP probably won't gain much more than they did last time unless there is a very strong flow from KSO or some combination of other micros. But about a 15% flow from KSO could still do it, if they can get that. Further changes to the main count did roughly nothing. My live standings continue to estimate that the Others parties vote is undercounted and will improve in what remains, but for both LDP and KSO this assumption won't necessarily hold as they are dropping rapidly. I am also wondering whether the initial count is reliable enough for these purposes or whether it might contain small errors - it will be interesting to square it with the final result. If we look at the actual live standings in the check count, it's currently CDP .5062 quotas, LDP .4911, ALP .4791 and PHON .4643. The initial count says that the CDP will tank a bit from here (as they should with more rural seats still undercounted) - but how precise is it? The Liberal Democrat vote continues to fall in the check count, now down to just 2.25, only a sliver ahead of C Dems in the main count and behind them in the check count. The Others parties remain apparently slightly undercounted in the check count but the LDP position is very vulnerable to both CDP and the left micros if they cannot maintain their share of the Others vote. The initial count reached 4,717,570 tonight and is probably just about finished. Changes were too small to update my live estimates, but Labor has got ahead of One Nation in them, and both LDP (now just 2.28% in the check count) and KSO (1.98%) suffered. With the Christian Dems and Animal Justice now pretty much "in the clubhouse" on what looks like about 2.17% and 1.83% the question is where those two can finish relative to them. A lot more has happened while I was writing my federal poll roundup. The main count has passed 4,663,000 and might have only 50,000 or so (if even that) to go. The Coalition continues to drop back and the Greens' surplus grows more significant (but is still not worth that much). The check count has a quota of 133,050. Keep Sydney Open have fallen to 2.00% and the Liberal Democrats have dropped to 2.29% - the latter have been crawling in recent hours. The Christian Democrats are still ahead of the LDP on the check count on 2.32%. Based on the main count, the CDP can be expected to drop back a little from here (perhaps in line with the Coalition also doing so). That is, provided the initial count is accurate as concerns the CDP vote (it is not subject to the checks of data entry in the check count). My projections are that the Others party vote is slightly under-weighted in the main count at the moment, on which basis the Liberal Democrats should come up. But maybe that under-weighting (if it's even real) is because the left micros are going to do well on absents to come, in which case the LDP might keep falling. I'm still not yet sure that the LDP are home vs the CDP, or that one of KSO or AJP won't be able to get over both LDP and CDP. When whoever loses out of KSO/AJP is cut out, preferences will be being thrown to the other one, ALP and four right-wing parties. There just might be enough there to get one of them up if there is, say, a 15% flow and similar from the Greens. The other issue is that the gap between non-blank and blank informals remains stubbornly around 2.4%, so I've set it to that level (for now). Counting has kept going with the check count now on a quota of 111,547. Keep Sydney Open have scored 1.21% in the last c. 500K added. If that continues for the rest of the check count they will fall to 1.73%, which would probably put them behind Animal Justice, in which case they are likely to be out of business. (Even if they then jump AJP on preferences, the gap to the leaders would be too large.) Ross Leedham's projection yesterday had them very slightly worse than this. I expect KSO to fall behind CDP, probably substantially so, over coming days. We'll need to see where KSO lands to see what hopes it might have of overtaking more than one other party on preferences. The Others vote in the main count has made gains during today's counting, apparently off absents which are likely to be good for KSO. That may help them to at least stay above Animal Justice, which in my view is extremely important for what chances of winning after preferences from behind they may have. KSO had better start swimming or you know what will happen; they're down to 2.24% already. Another large increase in the check count which is now up to 99748 votes (about half complete). KSO dropped to 2.30% in the check count. The Greens improved in the main count - last time there was a trend towards the Greens and left-micros doing well at the end of the count, but this time it won't help that much as Greens preferences are worth so little. Coalition 34.98 (7.696 Q), LDP 2.543 (0.559), KSO 2.387 (0.525), PHON 6.82 (1.500), CDP 2.17 (0.477), ALP 29.35 (6.457), AJP 1.76 (0.387), SUS-A 1.56 (0.342), SFF 5.43 (1.195), Green 9.33 (2.053). So it is possible that PHON would really be in front of KSO and Labor would really be in front of CDP. Quite a lot happened today. There was another big update to the initial count, which now has over 4,357,000 votes in it (based on the Lower House count there may be about 360,000 votes to go, not all formal.) Changes were minor, but the Greens gained .06%. Secondly the check count advanced to a quota of 88,678 (about 40%). It has become much more representative as concerns the Shooters vote, though it still has a way to go there. Keep Sydney Open fell further to 2.38% in the check count. The below-the-line rates for both Shooters and One Nation dropped. The other issue coming up is the strong evidence of a higher non-blank informal rate than 2015. In 2016 non-blank informals were 1.5%. They are currently running (based on the difference between the two counts) at 2.4%, in a count that's only very slightly skewed to areas of naturally high informal voting. This skew might be because votes with low informal rates are undercounted in the check count, but I'm getting wary of that assumption, and I've bumped the assumed non-blank informal rate up to 1.7%. Coalition 35.05 (7.711), LDP 2.55 (.562), KSO 2.41 (.530), PHON 6.84 (1.505), CDP 2.17 (.477), ALP 29.36 (6.459), AJP 1.75 (.385), SUS-A 1.53 (.336), SFF 5.44 (1.197), Greens 9.26 (2.037). So a big loss for KSO today on that projection, though some of that's caused by changed handling of informal votes. It might be worth keeping an eye on the rate they gain votes at from here (on a large enough sample). They're currently on 46,360/1,950,913. Again I am working through the day today so updates may be slow but it is notable that the Shooters have climbed to 3.45% in the check count, which means the anti-rural/regional bias in the thing is starting to dilute. The Liberal Democrats are now on 2.56% in the check count while Keep Sydney Open have fallen to 2.44%. In other news I am now treating Coalition-8 as an assumed win following further gains in the main count today. Also, the informal vote in the check count is stubbornly high still at 6.5% - which may suggest Others parties are now slightly over-represented in the check count. I'm still tracking the Greens in case they bounce up and look like having .1 of a quota surplus, but it doesn't seem like it will happen. The big mover here is Labor - down. Even after adjusting for leakage I now have them nearly .04 Q behind One Nation, which they would probably overturn but I couldn't be absolutely sure. If they drop back to the low 6.4 range, things start looking dicey. Worth keeping an eye on Ross Leedham's projections based on matching votes gained in the Lower House to counting in the same districts in the upper house, I understand with an assumed 0.9% for KSO in districts not contested. Currently these project KSO to crash out, dropping to below .4 Q, and Sustainable Australia to come up to a point where if the flow between the left (or confused-for-left) micros was strong enough then SA might be competitive (but still I doubt it; I think the micro preferences will flow more to Labor whatever is on their cards). KSO have now fallen below 2.5% in the check count; a few more tenths of a point will see them drop into the mix with PHON, ALP and CDP. Very busy with work and meetings today so not expecting to update projections until tonight. However, in the check count today the Liberal Democrats have moved out to lead KSO by 2.61% to 2.51% (these figures should be only very slightly inflated by pro-Others bias now). This would take KSO down to .544 Q on my crude projection, bearing in mind that they seem likely to drop further. The check count now overrepresents the Coalition and Greens but no longer much overrepresents Labor. Shooters are still very under-represented. Quota in the check count is now 65,535. We're now at a point where the total Others vote in the check count has just about got down to where I project it will finish. However, my current projection of where it will finish might prove optimistic if, for instance, (i) the non-blank informal rate stays higher than last time or (ii) Others parties generally performed badly in the votes presumably not yet added to the initial count (for instance if these included a lot of postals). If time permits I may look for more clues on this on the weekend. Both majors and the Greens are now overrepresented in the check count, and PHON and especially SF+F underrepresented. The question for Keep Sydney Open is how well they can hold their projected 2.50% (which has so far been more or less stable) before we get into the really bad seats for them. There are 31 seats still with less than 10% counted. KSO contested seven of these in the Lower House, with an average vote of 1.6%, less than half their average in all seats contested. Quota is over 57,000 now but the anti-rural and pro-ALP/Green skew is still just as apparent. The Liberal Democrats and KSO continue swapping positions in the check count for now. I'll hold off til tonight for a projection update because of work commitments during the day. Something a bit interesting did happen in today's check-count: One Nation's below-the-line vote as a share of its overall vote rose. Because BTL votes are not in the currently stalled "initial count", a high BTL to ATL ratio suggests a party is stronger than the initial count suggested. Early on, One Nation's multiplier to account for ATLs was as high as 1.094; this went down to the high 1.07 range but has now come up again to 1.083. I'm expecting PHON to drop .02 quotas to leakage, but they're getting into the range where Labor's task to catch them on preferences, while still pretty easy, is starting to be non-trivial. The other useful thing that's happening is that the total vote for the Others parties is becoming less and less out of whack with where it seems it should be based on the initial count. It's not far off parity in this regard. Once it reaches parity, any loss for one of the Others parties (eg KSO) will be a gain, on average, for the remainder (eg LDP). Also, see Ben Raue for an excellent look at how over-represented certain regions are in the count so far. Still not a lot to see today. The check count is at 53,802 on quota but is no more representative than it was at the start of the day as concerns rural seats. It is becoming much more accurate as concerns the Coalition vote, but still has Labor too high and the Shooters too low. The check count has now passed 50,000 on quota but the massive underrepresentation of rural and regional districts has if anything got worse. KSO and LDP continue to swap the lead among those competing for the last three seats but we really need to start seeing a better representation of rural seats to make the figures meaningful. Also there is still no progress on the main count. I will hold off updating projections until later because of these issues. It was a big day in terms of the size of the check count which more than doubled, but not such a big day in terms of learning about the vote strength of the Others parties, because the check count is so skewed. Also there wasn't any update to the main count, so I wonder if it will be completed. At the moment all that affects my estimates for parties in the main count is evidence regarding their above the line rates. Current live projections LNP 34.96 (7.690 Q), KSO 2.52 (.554 - expected to drop), LDP 2.49 (.548), PHON 6.82 (1.500), CDP 2.15 (0.473), ALP 29.42 (6.472), AJP 1.75 (.385), SUS 1.54 (.339), SFF 5.52 (1.214), Green 9.24 (2.033). I'm keeping an eye on the informal rate in the check count. This is currently at 6.24%, compared to 5.6% in 2015. However I think this could result from the check-count being weighted towards divisions with high informal votes as well as from it being against forms of voting with low rates, so I haven't done anything about that. The graph below shows that KSO are over-represented in the check counts in seats they contested. None of the nine seats where they ran but polled below 2% in the Lower House have hit 20% yet, while four of their best six (assuming an artificial 10% for Sydney where they actually didn't run) are overcounted. However Others parties as a whole are still overrepresented too, though only by 9% now, and my projection does take account of that. Keep Sydney Open's raw vote in the check count has dropped to 2.69% but their projected vote has actually gone up a little bit. This is partly because the overall vote for Others parties has declined, but also because a very favourable seat for them, Heffron, has become one of the best-counted seats in the check count. Seats KSO did not contest are no longer overcounted, and among the seats they did contest there is still a slight weighting towards their better seats, so I expect they will actually do worse than my projected 2.39% above. This is possibly also an issue in the seats they did not contest, because the Shooters, Fishers and Farmers are undercounted in the check count. However even after accounting for this, KSO might still finish in the low 2% range, which would give them chances to win with the aid of Animal Justice and other left preferences. Since I recorded KSO's vote early in the count, they have got 1.96% of votes added. Ross Leedham, who is modelling this count by matching Lower House votes, notes on Twitter that KSO are only just beating their Lower House count over the last 380,000 votes. Since KSO get votes for free on this comparison every time a seat they didn't contest is counted, that sort of result suggests they're not matching their Lower House count in the seats they did contest. I am no longer tracking VEP who have fallen below 1%; they together with Small Business Party, Aus Conservatives etc account for a projected total of 3.7% (0.807 Q) that will be available in preferences to other parties. Labor and the Greens have been dropping back in the projection because their below the line vote is falling in the check count as it takes in more outer suburbia and less inner urban voting. I'm not sure how representative that is. KSO have now dropped .036 of a quota on this projection since the iVotes came in as their share of the Others vote has fallen. There is a long way still to go and there are some strong KSO areas (such as Vaucluse and the northern beaches) that are now a bit undercounted. Not a lot has happened today. There was a thrilling moment when the Liberal Democrats got within 37 votes of Keep Sydney Open on the check count, and I expected a swap for the lead in the race for the final three seats, but it didn't happen and KSO are now 90 votes ahead! (The check count hasn't changed since 2:30). The initial count is now at 4.234 million. If it gets to 4.35 million without substantial change in the Coalition's position I intend to call their 8th seat then. KSO and LDP are on just over 3% in the check count, and KSO have been dropping rapidly. The Greens preferences looked significant earlier in the count but are tracking to be more or less irrelevant. Having continually noted things that might cause KSO to go down in the projection I have now noticed something that might pull the other way a bit. The check count is currently higher on average in seats that KSO did not contest in the Lower House and excluding the Sydney seat (12.67%) than seats where they did contest plus the Sydney seat (10.62%). Presumably the former would be worse seats for them. On the other hand, KSO's best 12 seats that they did contest plus Sydney are as well counted as the seats they didn't contest excluding Sydney. So are the remaining seats KSO ran in (where they averaged 2.4% and where on average below 10% is counted) better or worse for them than the average of their 13 best seats (including Sydney) combined with the remaining 50 seats that they didn't run in? I think the answer is actually worse, because for it to be better they would have to have polled not more than 1.2% in the Lower House on average in the remaining seats, but they only polled below that in a few far western seats. But it's possible that KSO support strength is not greatly overrepresented geographically in what has been counted. 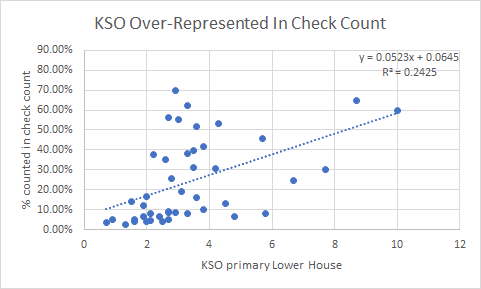 We also don't know if the relationship between KSO's upper and lower house votes (or what it would have got in the upper house) is proportionate. The Liberal Democrats continue to improve in my projection; they are now up to 0.522 Q vs 0.530 Q for Keep Sydney Open. It may well be that they will overtake KSO soon in the check count. The Coalition is also dropping back a bit (now projected to 7.696 Q) although they would need to underperform by several points in the remaining main-count votes to miss out. The check count hasn't been updated since about 2:30 but the main count has, with Labor now overtaking Christian Democrats on my projection. Labor would lose a few votes to below the line leakage but nothing significant. The Greens are drifting back to the point that their preferences could have virtually no impact (they may not even end up with two quotas). This is bad for Labor, but there are other parties that may give Labor useful preferences. Some seats are hugely oversampled in the check count, which is making it skew to Labor. Those with over 40% counted are Bankstown, Blacktown, Fairfield, Granville and Londonderry - all Labor seats (Fairfield has a high Christian Democrats vote.) Those with 20-40% counted are Blue Mountains, Cabramatta, Seven Hills, Strathfield and Sydney - all Labor on a 2PP basis except for Seven Hills. I haven't run a full update but in the votes counted since the update below Keep Sydney Open have taken a large hit in my projection, dropping back to a projected 0.529 quotas. This is the lowest value they have been at since the iVotes were added and again it is hard to be sure they are going to stay high in the race for the final three seats. All the top four Others parties dropped but the one that dropped least was Liberal Democrats, who might plausibly overtake KSO on primaries soon. I am also thinking that the Christian Democrats' position is rather difficult unless both KSO and LDP crumble, because their only natural preference source is Australian Conservatives, who basically have no votes. The quota in the check count is now 15,810 (6.9% counted). The check count is heavily skewed against the Coalition at present, such that Labor is actually leading on it, although we know from the main count that Labor should actually be about six points behind. What is notable is that the over-representation of the Others parties in the check count is declining, so that even though the vote for Keep Sydney Open in the check count has slumped from 3.84% to 3.32%, their standing in my projection isn't changing all that much (indeed it is up on yesterday). They only received 1.53% of the votes since my capture yesterday, so perhaps whatever votes have been added are unusually weak for Others generally. Coalition 35.1 (7.722 Q), KSO* 2.58 (0.568 Q), LDP 2.36 (0.518 Q), PHON 6.77 (1.489 Q), CDP 2.17 (0.477 Q), ALP 29.39 (6.466 Q), AJP 1.78 (0.396 Q), SUS A 1.78 (0.392 Q), VEP 1.07 (0.234 Q), Shooters 5.42 (1.197 Q), Greens 9.34 (2.055 Q). When it comes to preferences, I am still expecting One Nation to lose about .02 Q off leakage from Latham's surplus, which means that One Nation are effectively behind CDP in the projection. Also, the Liberal Democrats are better placed in the projection now than they were, having overtaken One Nation. However, the Liberal Democrats often perform poorly on preferences, and lack obvious preference sources in this contest. While preferences play a limited role in NSW, they would not necessarily be safe with this sort of lead. The check count is continuing to unroll slowly so I will probably rerun the "live count" projections a few times today, not every time there are slight changes. Note that the ABC site is now projecting seats directly off the check count and has therefore called seats for KSO and Liberal Democrats (and not called the Coalition's seventh when they will clearly win seven and are just about callable for eight). Both KSO and LDP could well win but to call them would be totally premature in both cases. Wednesday 8:10: The check count has advanced only slowly today and quota is now 13,729. (Final quota should be just over 200,000). Keep Sydney Open are still sliding gradually on the whole, now down to 2.47% in my model (3.59% in the check count now). I'm noting here their current vote (10,832 of 302,020) so as to track what they get over the next, say, 200,000, as a guide to where they might end up. I'm still not sure how competitive they are. Wednesday 6:30: These are my latest "live count" projections (not adjusted for vote location or iVote skew) following small updates to both counts. Keep Sydney Open had been dropping back, but the last update to the check count has reduced the non-Others party total and put them back almost where they were. There is a possibility that my model is overstating BTL votes for some parties based on where the check count votes are from. If this is so it would slightly favour the Others parties compared to the above. Wednesday 4:00: Hoped this would be a great day with votes piling in to the check count but alas still very little to report. The ABC website is showing Labor's 6th and the Greens' 2nd seats as in doubt because these parties have fallen below the relevant quota (which doesn't take account of some of the Others votes being informals or being BTLs for these parties). This is just a silly bit of programming; these seats are in no doubt whatsoever. Wednesday 3:30: Still no update to the check count from the slight change earlier today. However with another 400K added to the main count it is notable that the Greens and Others have gone down and Coalition has gone up slightly. This if it continues has implications for Labor's potential to overhaul LDP, CDP and PHON on preferences, and Labor has dropped 0.01 of a quota in my estimate compared to the last update. I'll post updated estimates when there is meaningful change in the check count. Some more votes are coming in but the check count still has a severe over-representation of micro-parties, so a re-run of projections is unlikely to be useful until the count advances significantly. I'll be keeping an eye on it through the day and will update when I think it is useful (possibly in an hour or two). A suggestion from Nick Casmirri is that iVotes (which would be likely to favour progressive micros) may have been added in a chunk last night, so it's quite likely some micros are being over-represented even relative to their booth vote more than others. 12:50 No NSWEC update since 11:30, except a very minor update to overall count that is not worth processing yet. 2:20 Still not much to see. I'm going to be working on this count on and off through the day because I think today is the day when things could get a lot clearer. Regarding KSO, Ross Leedham did a neat calculation finding what KSO would be on if their Legislative Council result matched their Lower House result, on the assumption that they ran in Sydney and scored 10% there. (Note that in many seats they didn't run and scored zero, but in most of those they would have only got 1-2% anyway). This calculation shows that the current check count (which has KSO on 3.84%) is indeed skewed to them, but not by as much as might be suspected. Indeed it projects KSO to about 2.8-3%, higher than my 2.5% - which I thought was probably inflated! Without more information on exactly how the check count is being conducted I wonder if there might be something going on that is skewing the output in favour of small parties more than would be suggested just from the range of seats included. An obvious candidate is that the booths counted are predominantly booth votes (and don't include many prepolls on which small parties tend to do badly.) However another one might be some kind of distortion in the rate in which small party votes are getting into the check count compared with larger party votes. If this is the case then as the count fills out it will normalise. The check count just had a huge update (its quota is now 11877, with some votes included from every division), but it included a lot of inner-city votes and has swung to over-representing the Greens, with a massive lift for Keep Sydney Open at the same time. So now Keep Sydney Open are likely to be over-represented in the check count! Unfortunately we don't have any seat by seat data on what each party is getting in each seat. We could use Lower House votes to estimate how under/over-represented the micros are based on the seats included, but this also has to be adjusted for number of Lower House candidates and parties not running in every Lower House seat - it all gets very messy. VEP have gone down further in this projection, and might come up but are not looking competitive now. KSO are probably over strength given the apparent link between their vote and the Greens', and given that Sydney (seat) is the most overcounted now, but where they will settle remains to be seen. LDP might be under-represented in the projection now if anything. The other point is that Labor are improving in their quest to get a seventh seat, on Greens preferences if not on primaries, and might well end up jumping all the micros. The check count has been updated, and while the numbers are still unrepresentative they are starting to look more like the overall count. 37 divisions are now included with Granville over 10%. The main count has had only a trivial update but the check count refines estimates for BTLs (including that Latham's share has gone down a little bit, so the multiplier there is "only" 1.088 now). I'm not bothering with anyone who doesn't project to over 1%. So improvements have been made here by Labor and KSO, while LDP and VEP are down. The question is whether KSO can keep improving at this rate. With the Green vote in the check count still slumming it at 6.3%, it's quite plausible that they can. The check count has started early. At this stage the votes counted are unrepresentative, both within divisions and in terms of the booths chosen within divisions - for instance the Greens are underrepresented in the current count while One Nation are overrepresented. However this brings a lot more clarity to the final contest. Firstly it allows me to refine multipliers for below-the-line voting in the Others pile, and the big news here is that Mark Latham has a huge below the line vote. Currently multipliers for the seven counted parties (ATL+BTL divided by ATL) are: Coalition 1.014, Labor 1.016, Greens 1.047, One Nation 1.094, Shooters 1.031, Christian Democrats 1.057, Animal Justice 1.039. All these are higher than last time but it's not obvious that anything in the selection of seats counted (only 33 electorates have anything counted at all) is driving it. So pending any later reduction I'm going to assume for now that it's a real thing and a result of more voters getting used to numbering multiple boxes c/- the Senate election. Now we actually have an early check count breakdown for Others, but bear in mind this is from a skewed sample of just 25,747 votes in which the Greens (especially) and Shooters are doing unrepresentatively poorly, while both majors, CDP and One Nation appear to be doing unusually well. The sample will therefore underrepresent both urban and distant bush electorates and probably overestimates seats in between. But these underrepresentations and overrepresentations are not going to save the bacon of any party polling way less than 1% in the sample, unless its vote is very regionally concentrated. However, given that the Green vote is undercounted (I project it is only 58% as high as it should be) I would expect that some of the micros in the list above - especially KSO and SA and possibly VEP as well - will rise by more than my 1.26 multiplier, while others (especially the Liberal Democrats) will therefore probably rise by less. This could bring SA and VEP up towards 2% and KSO up towards 1.5%. Even so, unless these micros have been even more underrepresented than the Greens, it is hard to get them up to level with One Nation and the CDP. One Nation will lose votes off Mark Latham's BTLs because of leakage. With 8.6% of their vote below the line it could be that, say, half of that leaks on Latham's surplus. However, currently I only project One Nation's surplus to be about 2.3%, meaning that the loss on leakage could be about 0.1% (.02 quotas). Currently they would still be fighting out third and fourth with the Christian Democrats. The other thing to bear in mind here is preferencing. Currently the four parties that are projected to be best placed on primaries are all right-wing, while the five chasing are various forms of centre-to-left. (Sustainable Australia has right-wing aspects in its anti-immigration stance and its status as a left party is dubious, but its voters tend to preference left-wing parties and can be assumed to be left-leaning themselves - suckers or otherwise.) The Greens will also have a substantial spare vote and Greens voters are strong users of preferencing. So there must be a realistic chance that even if things finish as per the above projection, one or two of the chasing pack can get over either One Nation or the Christian Dems (or LDP or Coalition should their vote fall). For those following preferences, keep an eye on this Tally Room thread re HTV recommendations, but remember that because NSW allows just a 1 above the line, most preferences exhaust, and those that don't frequently scatter. If Labor are excluded, their HTV card preferences generally go to the Greens (who will very probably be out by then), then Animal Justice, then Keep Sydney Open, and in some seats to VEP. In 2015, Greens preferences were distributed with 64.8% exhausting, 21.3% to Labor, 11.5% to Animal Justice, 2.9% to Liberal, 1.5% to No Land Tax and 1.7% to Christian Democrats (these were the only parties still in the count). At that rate on current projected votes, Labor would gain about 0.02 of a quota - which helps, but is not nearly enough by itself. Perhaps the preferencing rate will be higher this time - the other thing that can help Labor is that the Greens often lift in late counting. Monday night: I've seen a comment indirectly from Greens scrutineers that Buckingham is "no hope" and I think this figures given that the Green vote appears at this stage to have held up particularly well. So the order in the race for the final seat on live primaries is still Coalition, CDP, PHON, AJP, Labor. However both majors have dropped back and the Greens have come up (not unusual). The minimum target for other parties is still around Animal Justice's vote. If precisely one Others party has enough vote to get in, then we could see a contest between Animal Justice and the second One Nation candidate , which Animal Justice would be well placed to win with help from Green preferences. However depending on how the Others pan out, both or neither could win. Nick Casmirri has noted that the Others vote is high in the city and especially high in the Sydney electorate, which seems to bode well for Keep Sydney Open. It's still early days in the Legislative Council count but here's a post to try to start making sense of what incomplete information we have. Let me start by saying that this count is an absolute mess and there are at least three seats we are nowhere near being able to call and will not be near being able to call for a long time. 1. Above the line number 1 votes for Liberal-National, Labor, Greens, One Nation, Shooters Fishers and Farmers, Christian Democrats and Animal Justice. 3. All other votes. The others pile includes all votes for the remaining 13 grouped tickets as well as all the below the line votes for individual candidates. It also includes informal votes that are not blanks. While I understand the OHS aspect as concerns work on the night, what I don't get is why we have to wait til the check count from Wednesday on for this "others" pile to be sorted even roughly to party. Especially now when there are fewer close Legislative Assembly seats than would have been expected. In 2015, non-blank informals were about 1.5% of all votes that were not blank informals, so on that basis the Others vote contains about 1.5 points of informals. After removing these from the count, all the party totals including the remaining Others will increase (ignoring further vote movements based on which seats and vote types have been counted). The Others votes also include below-the-lines, some of which will be for the seven separately counted parties. Here the 2015 below-the-line rates can be used to determine how much the party totals for these seven should be expanded by to account for below-the-lines. Thus I multiply Animal Justice by 1.03, Liberal-National by 1.008, Labor by 1.012, Shooters by 1.022 and Greens by 1.037. For Christian Democrats their multiplier was 1.039 in 2015, but 1.028 in 2011 when Paul Green rather than Fred Nile was the candidate. I will use the Paul Green figure. Unfortunately the party I don't have a multiplier for is One Nation. In 2011 One Nation ran as an unnamed ticket with Hanson herself as head candidate, and the multiplier was a whopping 1.258. However that seems to have been down to the lack of a party name. If we look at the 2016 Senate election, the multiplier for One Nation in Queensland where Hanson was the candidate was slightly lower than for the Christian Democrats and slightly higher than for the Shooters. In NSW the multiplier for One Nation was only very slightly higher than for the Shooters. Mark Latham is a prominent candidate in his own right so I've decided to use a multiplier of 1.03 for One Nation in this case. It's possible below the line voting could have become more common following the Senate changes, but there are not many reasons to suspect this. There are two minor special reasons it might be the case though - firstly, faction-fighting within the Greens over their ticket order, and secondly, the minor cult phenomenon (as seen on Twitter) of voting below the line all the way to put Mark Latham 346th. However I doubt either of these will have a significant impact. Bear in mind that these are estimates of the live count and do not account for whether where the votes are from might be unrepresentative. These totals will move around substantially as more votes are counted. On raw quotas the current seats are seven L-NP, six Labor, two Green, one ON, one SF+F, leaving four undecided. These are then decided by the remainders after preferences - and usually in NSW there are not that many of those. At present of the listed parties the order for the remaining four seats is L-NP, CDP, One Nation, Animal Justice, Labor. But these last four are all rather close together and the order will shift around as more votes are counted. The first question then is whether, among the 11.15% split between 13 remaining parties, there is anyone who has polled enough to get into this mix. Currently, the target figure based on just primaries is to beat Animal Justice, which means getting about 1.8%. Small parties do not poll as well in the Upper House as in the seats they contest, because there are more small parties, and because they tend to contest favourable seats. This at least suggests that Keep Sydney Open are competitive with AJP for a possible seat, and that SA could be vaguely competitive, but if Labor lifts there may not necessarily be a seat for any of them. Preferences could also come into play here, with an attempt by Glenn Druery to network how-to-vote card preferences between these groups that will probably not have much impact - but in a close race any impact at all could make a difference. It may be that KSO are more successful than AJP in outperforming their Lower House vote in the upper house. On the other hand, their vote could be negligible outside Greater Sydney (see comments). On the other other hand, they didn't run at all in the lower house in their single most prospective seat of Sydney. The Australian Conservatives are also attracting an average Lower House vote to suggest they might be in the mix - in the 19 seats they're contesting they are on an average 2.59%. However there may be an aspect of cherry-picking in their seat selection, and also their average is obviously skewed upwards by a few seats where there were only 4 or 5 candidates. I suspect that SA, KSO and CON between them account for something like 4.5-5% out of the missing 11.15%, leaving about 6.5% for the remaining parties. Socialist Alliance, Monaghans and Jansson are likely to get very little, Flux are never big scorers, VEP got nearly 1% last time. There might be something approaching 5% between Advance, Seniors, Small Business, Buckingham and Liberal Democrats. It seems plausible based on all this that the Liberal Democrats might have enough votes hiding in this mysterious others pile to get David Leyonhjelm over the line, but we will have to wait - a long time - to see!
" It may be that KSO are more successful than AJP in outperforming their Lower House vote in the upper house." This will be interesting. It's worth thinking about which seats KSO actually contested. So, they didn't contest regional seats where they wouldn't expect much support. That would indicate that their vote would be well down on the average calculated. However, they also did not run in the seat of Sydney! Apparently because Alex Greenwich, who increased his majority as an Independent in the seat, is the most supportive of their platform (I got this explanation from a dedicated KSO supporter). As best I can tell Greenwich did not issue an HTV for the upper house. His lower case HTV was a just vote 1 card, so his supporters have been given no guidance as to which way to vote in the upper house. It could be that KSO gets a large vote share in the seat of Sydney that offsets some of the lower share in the bush. First numbers from the progressive count check are starting to come in. I haven't done that yet. It is tricky because of the number of differences in the competing parties and their relative standings. In 2019, One Nation, Liberal Democrats and KSO weren't in the mix for seats, while the Shooters and No Land Tax were receiving preferences but won't be (at least at the pointy end in Shooters' case) this time around. Also it looks like Animal Justice preferences will be thrown, which didn't happen last time. What is important is that no-one ever makes huge gains in these things compared to the primary count. In 2015 at the point at which the Coalition's final candidate was excluded (which is probably a good comparison point) the following had been gained: Labor .085 quotas, Animal Justice .065, Shooters .044, Coalition .042, No Land Tax .025, Christian Dems .015. Much of the difference between parties was caused by the Greens surplus, but this time they have no surplus to speak of at present. On the other hand the AJP preferences, if thrown, may work in a similar way for Labor. This time there might also be more above the line preferencing - but I don't know that. On current numbers, Labor would jump enough parties ahead of it to get elected. It might even jump everyone except the Coalition. I do not see AJP, SUS-A as having a chance if it finished as per the current numbers. I don't see CDP jumping One Nation if behind them on primaries, and I doubt ON would jump KSO on the current numbers, but if KSO keep falling that will soon change. Ok, first off I think Labor are a shoe-in. They're going to score preferences at a per preference rate higher than any of the others, maybe a many times higher rate. And if we think about who is above them and whether the preferences will generally flow left or right, then it's only KSO on the left who are higher. In particular I expect the ALP to pick up most of the Janasson and Buckingham preferences, as well as the Greens surplus. So, I expect the ALP to easily overhaul the CDP and ONP, putting them easily in the top 3. Mark Latham's big below the line vote puts PHON's no. 2 candidate in a precarious position. I think a significant number of people would probably have gone below the line for Latham but wouldn't want to risk electing another Fraser Anning or Malcolm Roberts, so I expect those votes to leak like crazy, and for the CDP to pass PHON on primaries. I then think it will stay that way because I think a significant number of people who number all the boxes (either below the line or above it) do so in order to put PHON last (or close to it) -- there is a history of exactly this at NSW upper house elections. That leaves KSO, LDP and the CDP in the best position to advance with the ALP. I can't see the AJP overhauling the 0.1 quota gap on primaries to the parties above them, and no one else is within about 0.2 quotas. That's a tough ask. If SFF were closer, then maybe, but at present it's too big a gap. Based on that KSO are probably going to soak up any remaining left leaning preferences not absorbed by the ALP. I think they'll probably be the last elected -- because most of the remainders are to the right -- but exhaustion will be high so being in top spot and never actively ticking anyone off over a 3/4-year period will help them. What puts their position in the most doubt is the ~0.2 quotas for the SFF. I can't see anyone voting for the SFF giving a damn about whether Sydney is open or not. However, in order for me to predict they will miss out, I'd be suggesting the CDP could catch up the 0.06 quotas they are behind them, and that at the same time the LDP maintain their slim lead, which seems like a lot. But working out which of the the CDP or LDP gets the 2nd last spot will be tougher. It's going to come down to which of those two parties can pick-up SFF and PHON preferences at a higher rate. Additionally while I might expect the CDP to get more of the CON share, LDP might get more of the SBP share. The CDP might also gain a significant minor fraction of the SUS-AU vote. This is going to be really tight, but I think the LDP have the advantage at present. Updating at the end of the check count: I still don't think ONP will have their number 2 elected. I expect the exhaust rate to bring them down, and then for a large number of people to have filled in lots of preferences with the express purpose of putting them last. I'm now not sure which of the CDP or LDP will get over the top of them. But it seems the AJP have passed KSO as favourites for the last seat. It will be interesting to see how much of a factor putting ON last is. One issue with it is that a lot of the votes that do so will lodge at some point with Labor or Coalition and cease to have any further impact. Thanks for that. Yes, I was wondering if the ALP might jump a few. I also noticed that on its website SUS-A was recommending second pref for KSO. IF (i) their voters noticed that and (ii) they followed the advice, that would keep KSO in the running. Meaning election for LNP #8, LDP, KSO aand ALP #7 and only 1 ON and no CDP. But who can tell? If the button was pressed on my projected totals at the moment I'd expect ALP, LDP and KSO to win (in whatever order). But I have a lot of doubt about where KSO especially will finish on the primary count. Something like .44 quotas could still be winnable for them, because there are more left preferences and left voters use preferences more. I expect that neither SUS-A nor AJP preference recommendations will have any impact to speak of (unverified reports that Glenn Druery encouraged them to hand out as many HTV cards as possible notwithstanding). But voters for AJP in particular should preference KSO to a reasonable degree through voter choice. By the time AJP is chopped the even left-wing-ish options will be down to Labor and KSO, and KSO is likely to appeal to AJP voters who are likely to be young. SUS-A preferences tend to flow slightly to left parties but more weakly than AJP, so I wouldn't expect a huge amount of help there. I would also think SUS-A's support base is older, but I could be wrong. I should also note that if CDP get cut out, their preferences will go much more to the Coalition than PHON. If PHON get cut, their preferences will go to the majors. So on current projected primary numbers, even though the LDP are often slow-moving on preferences, I don't see either of the other right parties getting near them. Instead of 5.22 (2.14) it was actually meant to be 5.52 (1.214) ! You wonder if the "main count" will be completed? I don't think there'd be much point - rather than "main" it was really only a quick-and-dirty preliminary count. It's much more to the point that the EC now concentrate on getting the _real_ (ie, "check") count right. They're slow enough anyway without distracting themselves by finishing an irrelevant count. There isn't any indication in the count explainer https://vtr.elections.nsw.gov.au/info/lc#count that the initial count will cease. Indeed it seems to imply otherwise "This process will apply for all Legislative Council initial 1st preference counts for voting centres, early voting centres, iVote, postal and the various declaration vote types." Unless perhaps they mean that not all votes will receive an initial count. My view is that electoral commissions should make information publicly available that assists people watching the count to project it as quickly as possible (and also to spot errors in it). In this light, how quickly/whether the initial count finishes is a relatively minor issue - the biggest problem is the lack of breakdown of the check count results (not just the % counted) by division. Now the check has finished.. Sustainable Australia preferenced KSO first, so if they get knocked out, won't that place KSO above AJP? Virtually no-one voting for small parties on the left will follow the how-to-vote cards. SAP prefs will scatter - to exhaust, some to Labor, some to KSO. I'd be surprised if they put KSO over AJP and one scrutineer said he suspected more of them were actually going to AJP. Last time the Greens went much more to Labor (20%) than AJP (11.5%) despite the Greens preferencing AJP on their card. Most of the Greens' preferences exhausted, but their exhaust rate was lower than others. Labor will be in the count and continuing to soak up preferences. If KSO are to get over AJP I suspect they'll need to do it from multiple preference sources, not just SUS-A (if SUS-A are any use to them at all there.) The break from any one party isn't likely to be strong enough. I don't believe Sustainable Australia preferences will help KSO against AJP. 1. Sustainable Australia's votes are mainly outside of Sydney, so preferencing a Sydney-centric party is just less likely. 2. Sustainable Australia were third on the ballot paper, followed by the Greens and then AJP. 3. Sustainable Australia is only 22% of the potential votes to be distributed before KSO could be eliminated. Most of the other 78% won't favour KSO over AJP. KSO will need to pick up votes from more than just Sustainable Australia anyway to overtake AJP but it really isn't going to happen anywhere. Greens, Buckingham, Socialist Alliance, SFF, VEP (also stronger regionally) will all have more preferences for AJP than KSO I think. Small Business or Conservatives are actually the two where I think KSO could beat AJP in terms of preferences but that's not going to be many votes difference, maybe hundreds. No idea on Flux or Advance but I don't think any of that matters much.